Eldawy, of Pensacola, Florida, is a Coronat Scholar, a member of the Renée Crown University Honors Program, a 2018 Truman Scholar and a 2018-19 Remembrance Scholar. She has spent the Fall 2018 semester in Washington, D.C., through the Maxwell-in-Washington program. In Syracuse, Eldawy has interned at the North Side Learning Center, a local refugee education center, for three years. There, she teaches English to high school girls from Somalia and Syria. “These girls have taught me the meaning of resilience and inspire me in my work on refugee education policy and in breaking down racial and socioeconomic barriers in the U.S. as a whole,” she says. She has also worked in education centers in Santiago, Chile, with Bolivian and Peruvian immigrants there, and in Tyre, Lebanon, with Palestinian refugees. Eldawy has been involved with interfaith work and activism through the Muslim and Arab student associations on campus. “I believe that dialogue through one-on-one, grassroots community building is an invaluable tool to break down barriers, as we try to do on campus,” she says. 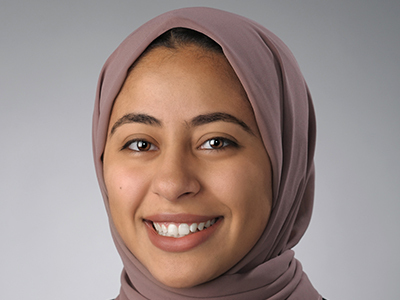 This semester, Eldawy is interning at the Migration Policy Institute in Washington, D.C., working as a research intern for the National Center on Immigrant Integration Policy. The center focuses on national and local education policies in place for immigrant communities and English language learners. “My internship ties directly with the work I do in Syracuse, especially because my senior honors thesis is a direct action plan that addresses English language services for Syracuse refugee communities. It has definitely solidified my interest in studying refugee populations and education policy in my graduate studies,” she says. The Marshall Scholarships were established in 1953 by the British government to honor the ideals of the Marshall Plan and the special U.S./U.K. relationship. SU’s first Marshall Scholar, John Giammatteo, was selected in 2010 and was a 2011 Marshall Scholar.